You may be among the companies still operating under a traditional time-off policy, offering a set number of vacation days and a separate allotment of sick days to your employees. But many companies have made the switch to general paid time off, or PTO, which combines sick and vacation time in a single policy. Under a PTO policy, your employees are granted a total number of days off, which can be used at their discretion. Whether they’re taking time off to lie in bed with a fever or on a beach with a good book, the choice is theirs, and they don’t need to specify for reporting purposes. Sounds pretty good, right? And many employees also see PTO as a benefit. But whether it’s a good decision to change from a traditional time off policy to PTO isn’t a simple yes or no question. Here, we’ll weigh the pros and cons of each so that you can make an informed decision. Naturally, employees want to maximize the number of days they can take off for fun reasons, like travel and time with family or friends. But when combining sick and vacation days into a single PTO plan, many companies slightly reduce the total number of days or hours offered. Your employees may feel cheated now that their sick and vacation days are combined. You may see fewer employees taking sick days – even when warranted – because they’d rather save their PTO for vacation time. If this is a concern, keeping sick time off and vacation time off separate may make sense. It also ensures that your people take time off when they are ill to recover. This stops the spread of sickness around your office and gets them back to productivity faster. 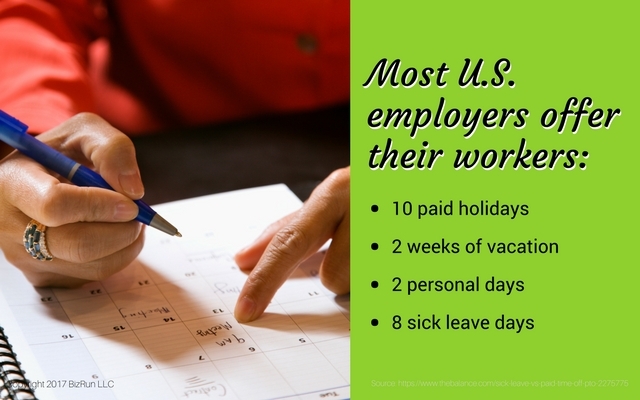 Similarly, sick days are typically a use it or lose it item, where vacation time can typically be carried forward. Keeping the two separate can save you the liability of carrying forward more time than you might have to under a combined PTO approach. In fact, one of the common downsides of a PTO policy is this very liability. While you may experience gains from not having to track time off as you did under separate policies, you may pick up the burden of carrying forward more banked time off. Since employees’ natural inclination is to maximize their vacation time, you may see employees saving up what would have otherwise been used as sick days to add to their growing vacation bank. Despite the carry-forward liability, many companies opt for PTO primarily because it reduces the administrative requirements. Eliminating the need to track separate sick and vacation days for all employees, particularly using outdated methods like spreadsheets, can be an awesome achievement. As mentioned earlier, many companies reduce the total amount of time offered when switching to PTO. On average, US employers offer 10 paid holidays, 2 weeks of vacation, 2 personal days, and 8 sick leave days a year, so even reducing that total by a day or two could be advantageous. Traditional time-off policies also often make this time available after a certain period of employment, like 90 days. But under a PTO policy, you might require employees to earn or accrue their time off. Even if they’re able to start earning on day one, this approach may benefit you. Let’s say a new employee can earn 4 hours, or a half-day, off for every 80 hours, or two weeks, worked, starting on their first day. They can take paid time off sooner, but they’re also earning it as they go, instead of getting it in a lump sum. In this example, you’re also offering less paid time off than under a traditional policy. Your employees earn one day per month or 12 days per year. Given the average of 20 days off under a traditional policy, you can see how PTO can benefit your company. PTO also provides your employees more flexibility. With traditional systems, what happens if an employee has used all of her sick time and then comes down with a nasty flu bug? With PTO, that’s not an issue. As long as the employee has earned the time, she can take it. And if she hasn’t, you can always allow her to carry a negative balance if you choose. Aside from the administrative relief, perhaps the best by-product of PTO is its impact on your employees and culture. By empowering them to use time off as they see fit, you’re demonstrating that you trust them to make good decisions. You don’t need to be a watchdog for their behavior (we’ve all heard the fake cough when an employee calls in sick), and they are encouraged to manage themselves like the adults they are. They are trusted to make decisions about when they take time off, regardless of the reason. Should you be ready to transition to a PTO plan, you’ll want to take measures to ensure the switch is a smooth one. You can expect lots of questions from employees and face several questions yourself that need to be decided. For starters, will employees get the same total number of days off under the new policy as they did when there were separate vacation and sick buckets? That often isn’t the case, which may cause employees to get upset, since their total number of paid time off days will shrink. You also have to determine how to handle any unused days at the time of the transition. Some states require a legal carry forward of unused vacation time, so you may need to convert this time to PTO, starting your employees with time in the bank, so to speak. This transition also provides a good time to evaluate eligibility requirements. Will you offer PTO to all employees, even part-timers? Will you offer PTO in a lump sum to employees or have them accrue it, similar to our previous example? Will there be a waiting period before eligibility begins? You also need to decide whether PTO will roll over at the end of the year, or whether you want to implement a “use it or lose it” policy. Before you make a decision either way, be sure to consult your state and local regulations to be sure you’re in compliance with any requirements about the carrying over of vacation time or PTO. Regardless of the time off plan you choose, you want to be sure you’ve defined it in a formal policy and clearly and consistently communicate it in your employee manual and onboarding process. Should you make a change, consider doing it effective January 1 and beginning communications several months beforehand. There’s no such thing as over-communication when it comes to your employees’ time off. Paid time off is arguably one of their most valued benefits, so make the decision that’s best for your company and then communicate, communicate, communicate. 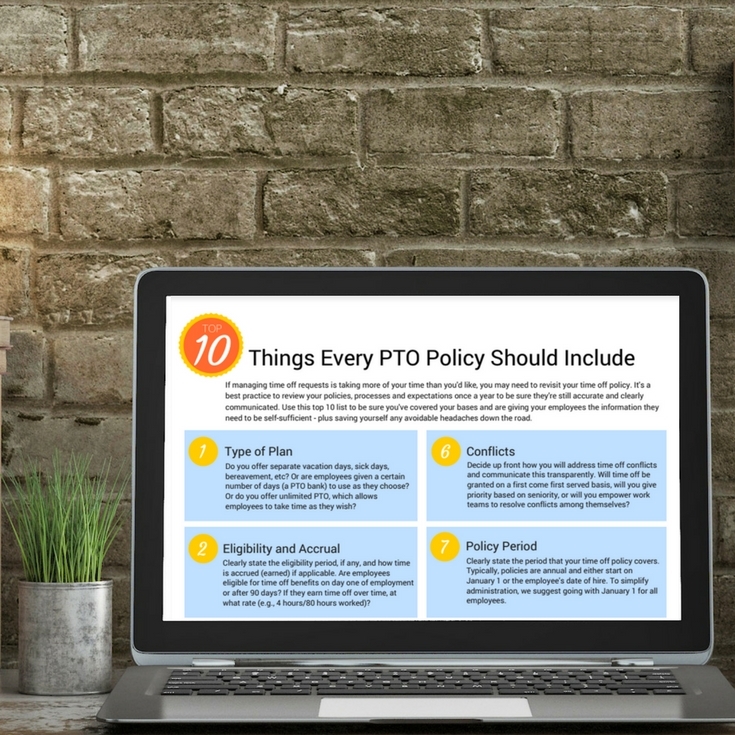 Does your PTO pol﻿icy include these 10 key components? Get our FREE cheat sheet to find out﻿. Get our FREE cheat sheet to find out.